Download "TOWARDS A COMPETENCE BASED CURRICULUM FOR STM TEACHERS: A COGNITIVE MODE"
1 TOWARDS A COMPETENCE BASED CURRICULUM FOR STM TEACHERS: A COGNITIVE MODE Mihaela Singer, Ligia Sarivan Institute for Educational Sciences, Bucharest, Romania We review recent attempts to harmonize academic learning outcomes among European universities. 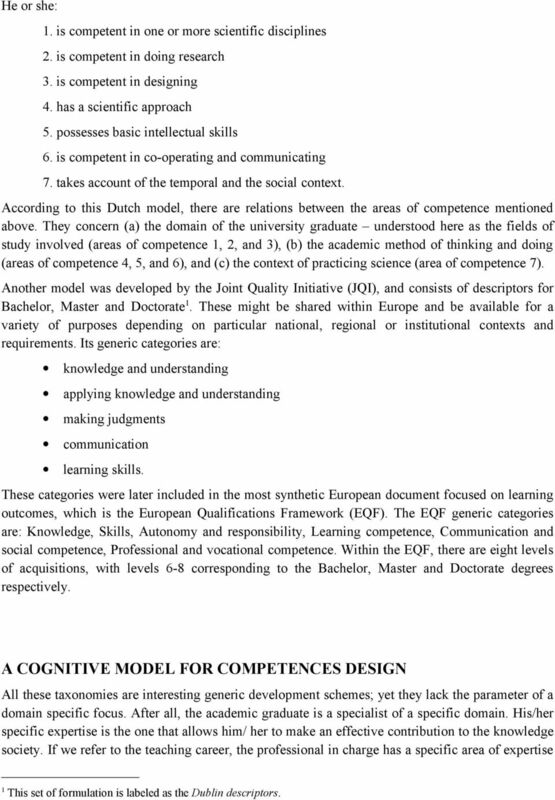 We propose a cognitive model for competences design at tertiary level of education that takes into account the interdependence of the individual factor, the epistemological factor, and the social factor. A matrix for competences development shows how the model can be applied in initial training for the STM teaching career. HARMONIZING COMPETENCE DEVELOPMENT IN HIGHER EDUCATION A few traits that tend to become global characterize the present society in connection to education: first, it is competition-based; second, it is a mass producer of information, in which access and processing are open to everybody; third, in the context of globalization, the traditionally elitefocused education attempts to shift towards a quality mass education at all levels of instruction, including the tertiary segment. Are nowadays universities ready to take the challenge of such changes? Are initial teacher training institutions able to cope with the huge need of quality education the knowledge society displays? Our paper aims at offering some answers to these questions in terms of curricular opportunities. The very end of the 20th century brought about a vivid discussion on a competence-based academic curriculum. A number of European initiatives, all aiming to the same target i.e. a model for competence development in the light of quality assurance education, have given different results in terms of the end product. The Tuning Project started in 2000 by proposing a model to harmonize academic process and outcomes and to assure the quality of education in European universities. Basically, the graduates profile should encompass competences in three large categories. These are: instrumental competences: cognitive abilities, methodological abilities, technological abilities and linguistic abilities; interpersonal competences: individual abilities like social skills (social interaction and co-operation); systemic competences: abilities and skills concerning whole systems (combination of understanding, sensibility and knowledge; prior acquisition of instrumental and interpersonal competences required). Another systematic framework for competence development was started at Eindhoven University of Technology (NL). By 2005, the results of this effort have been adopted by Delft University of Technology and the University of Twente (NL). On the basis of this aforementioned research, it is possible to distinguish seven areas of competence that characterize a university graduate. 2 He or she: 1. is competent in one or more scientific disciplines 2. is competent in doing research 3. is competent in designing 4. has a scientific approach 5. possesses basic intellectual skills 6. is competent in co-operating and communicating 7. takes account of the temporal and the social context. According to this Dutch model, there are relations between the areas of competence mentioned above. 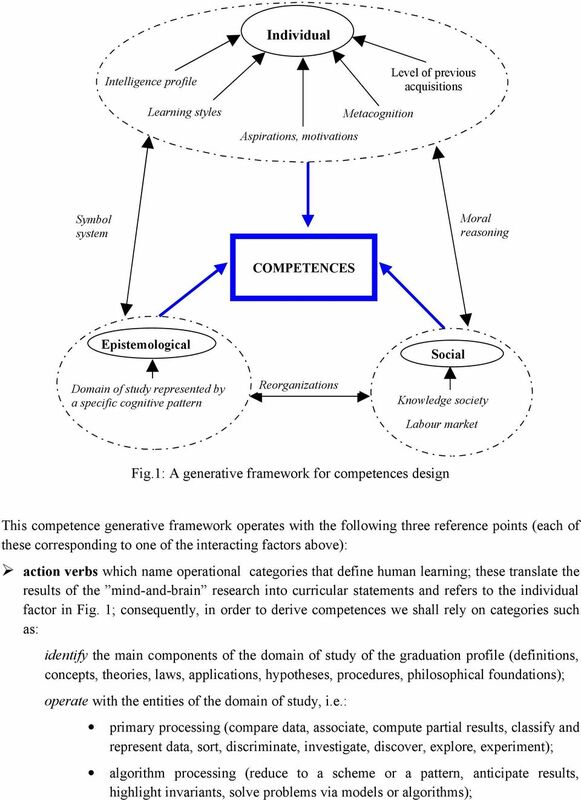 They concern (a) the domain of the university graduate understood here as the fields of study involved (areas of competence 1, 2, and 3), (b) the academic method of thinking and doing (areas of competence 4, 5, and 6), and (c) the context of practicing science (area of competence 7). Another model was developed by the Joint Quality Initiative (JQI), and consists of descriptors for Bachelor, Master and Doctorate 1. These might be shared within Europe and be available for a variety of purposes depending on particular national, regional or institutional contexts and requirements. Its generic categories are: knowledge and understanding applying knowledge and understanding making judgments communication learning skills. These categories were later included in the most synthetic European document focused on learning outcomes, which is the European Qualifications Framework (EQF). The EQF generic categories are: Knowledge, Skills, Autonomy and responsibility, Learning competence, Communication and social competence, Professional and vocational competence. Within the EQF, there are eight levels of acquisitions, with levels 6-8 corresponding to the Bachelor, Master and Doctorate degrees respectively. A COGNITIVE MODEL FOR COMPETENCES DESIGN All these taxonomies are interesting generic development schemes; yet they lack the parameter of a domain specific focus. After all, the academic graduate is a specialist of a specific domain. His/her specific expertise is the one that allows him/ her to make an effective contribution to the knowledge society. If we refer to the teaching career, the professional in charge has a specific area of expertise 1 This set of formulation is labeled as the Dublin descriptors. 3 as well. In the same time, the taxonomies above often refer to the student as an individual, yet, conceptually speaking, the individualized approach remains quite vague and the learning outcomes are rather expressed in terms of social needs, not in terms of cognitive propensities of the individual. In this respect, we propose a generative model that is based on mind and brain research. We start from the idea that learning within a domain is efficient (maximum educational benefits with minimum effort and resources) and effective (meaningful and relevant for real life problem solving) if it is focused on the acquisition of domain specific symbol system and procedures, i.e. the very entities that enable the structuring and functioning of a specific thinking mode (e.g. Glaser, 1988; Gardner, 1993; Hirchfeld and Gelman, 1994; Bransford et al, 2000). Consequently, the successful learners are the ones who are able to reorganize their already acquired structured sets of abilities and chunks of information in order to obtain new procedural configurations that are adequate to new situations and to new problems understanding and solving. The key to such proficient learning is the development (and implementation) of a competence-based curriculum that encompass procedural and conditional knowledge in a dynamic organization. 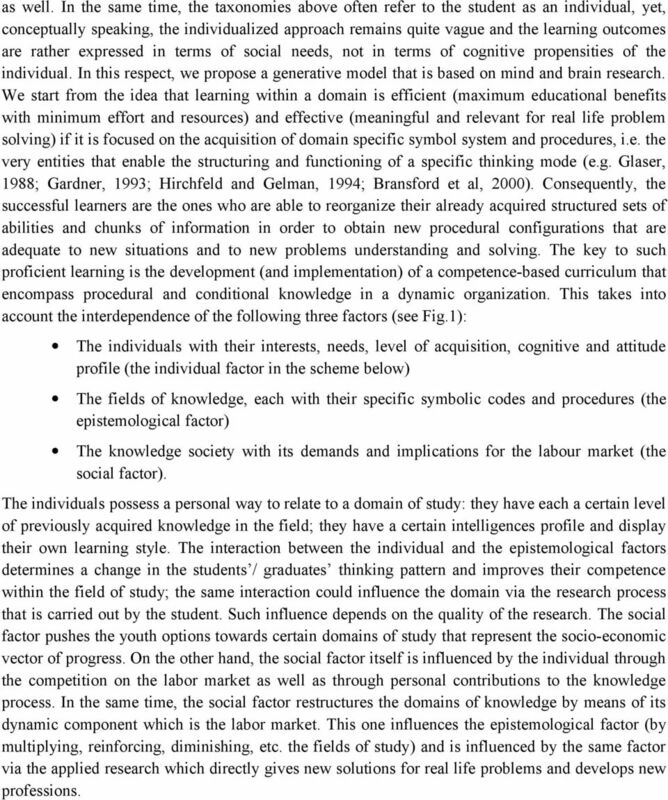 This takes into account the interdependence of the following three factors (see Fig.1): The individuals with their interests, needs, level of acquisition, cognitive and attitude profile (the individual factor in the scheme below) The fields of knowledge, each with their specific symbolic codes and procedures (the epistemological factor) The knowledge society with its demands and implications for the labour market (the social factor). The individuals possess a personal way to relate to a domain of study: they have each a certain level of previously acquired knowledge in the field; they have a certain intelligences profile and display their own learning style. The interaction between the individual and the epistemological factors determines a change in the students / graduates thinking pattern and improves their competence within the field of study; the same interaction could influence the domain via the research process that is carried out by the student. Such influence depends on the quality of the research. The social factor pushes the youth options towards certain domains of study that represent the socio-economic vector of progress. On the other hand, the social factor itself is influenced by the individual through the competition on the labor market as well as through personal contributions to the knowledge process. In the same time, the social factor restructures the domains of knowledge by means of its dynamic component which is the labor market. This one influences the epistemological factor (by multiplying, reinforcing, diminishing, etc. the fields of study) and is influenced by the same factor via the applied research which directly gives new solutions for real life problems and develops new professions. 6 show the development of teaching competencies as transfer acquisition at the intersection of the expert profile and the teaching operational categories. 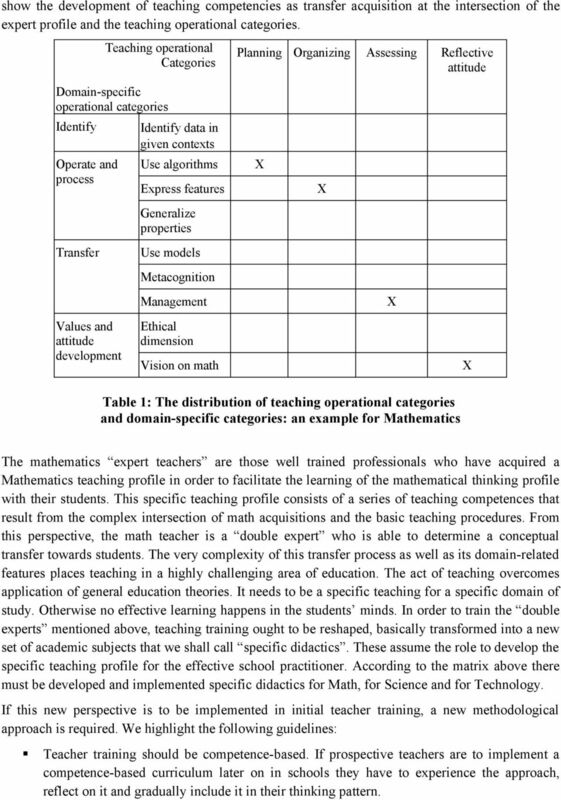 Teaching operational Categories Planning Organizing Assessing Reflective attitude Domain-specific operational categories Identify Operate and process Identify data in given contexts Use algorithms Express features Generalize properties Transfer Use models Metacognition Management Values and attitude development Ethical dimension Vision on math Table 1: The distribution of teaching operational categories and domain-specific categories: an example for Mathematics The mathematics expert teachers are those well trained professionals who have acquired a Mathematics teaching profile in order to facilitate the learning of the mathematical thinking profile with their students. This specific teaching profile consists of a series of teaching competences that result from the complex intersection of math acquisitions and the basic teaching procedures. From this perspective, the math teacher is a double expert who is able to determine a conceptual transfer towards students. The very complexity of this transfer process as well as its domain-related features places teaching in a highly challenging area of education. The act of teaching overcomes application of general education theories. It needs to be a specific teaching for a specific domain of study. Otherwise no effective learning happens in the students minds. In order to train the double experts mentioned above, teaching training ought to be reshaped, basically transformed into a new set of academic subjects that we shall call specific didactics. These assume the role to develop the specific teaching profile for the effective school practitioner. According to the matrix above there must be developed and implemented specific didactics for Math, for Science and for Technology. If this new perspective is to be implemented in initial teacher training, a new methodological approach is required. We highlight the following guidelines: Teacher training should be competence-based. If prospective teachers are to implement a competence-based curriculum later on in schools they have to experience the approach, reflect on it and gradually include it in their thinking pattern. 7 Prospective teachers should be taught in order to get deep understanding of a school subject in action. Consequently, they should experience their learning and get involved in real classroom problem solving. Project work is a good option in this respect. All that is taught must be contextualized in the real setting of the school. If learning is contextualized it is more effective. Moreover, the context of the real school helps the teacher trainers themselves to readjust their courses to the current educational issues. The teaching/ learning strategies ought to be both concepts to being explored by students and methods to present new knowledge to students. Gradually, they become the students own professional tools. The teacher of the prospective teachers should set an example in building a research partnership with students; more generally, the initial teacher trainers should make no difference between what is taught and their behavioural pattern. The assessment needs to be transparent, criteria-based and reflect a competence-based approach. Thus, prospective teachers learn from their own experience and further transfer a fundamental acquisition in their profession. Nowadays, the quality of education is a frequent topic under public debate, in the headlines, in political campaigns. As a consequence, the teaching profession is also in the spotlight. Despite the overall attention, the teacher s status spirals down everywhere in the world. 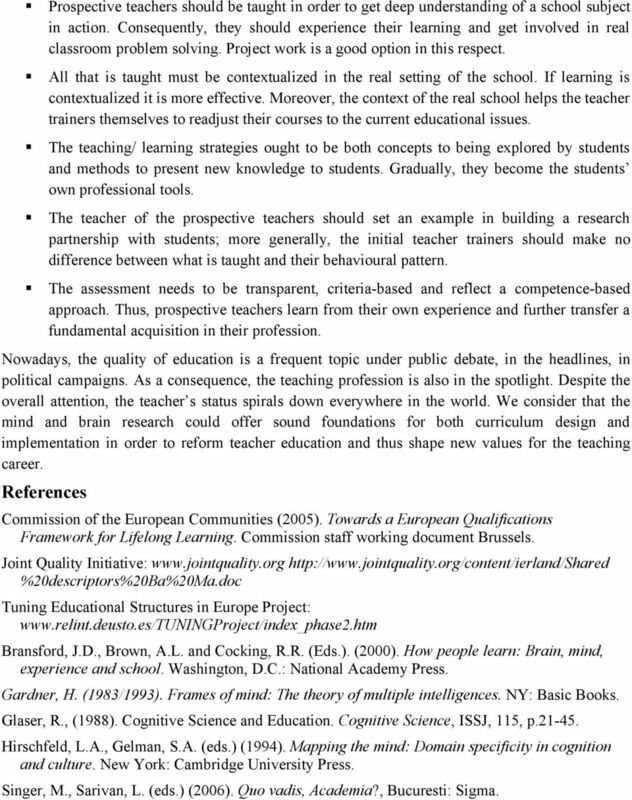 We consider that the mind and brain research could offer sound foundations for both curriculum design and implementation in order to reform teacher education and thus shape new values for the teaching career. References Commission of the European Communities (2005). Towards a European Qualifications Framework for Lifelong Learning. Commission staff working document Brussels. Joint Quality Initiative: %20descriptors%20Ba%20Ma.doc Tuning Educational Structures in Europe Project: Bransford, J.D., Brown, A.L. and Cocking, R.R. (Eds.). (2000). How people learn: Brain, mind, experience and school. Washington, D.C.: National Academy Press. Gardner, H. (1983/1993). Frames of mind: The theory of multiple intelligences. NY: Basic Books. Glaser, R., (1988). Cognitive Science and Education. Cognitive Science, ISSJ, 115, p Hirschfeld, L.A., Gelman, S.A. (eds.) (1994). Mapping the mind: Domain specificity in cognition and culture. New York: Cambridge University Press. Singer, M., Sarivan, L. (eds.) (2006). Quo vadis, Academia?, Bucuresti: Sigma. General Guidelines of Grade 1-9 Curriculum of Elementary and Junior High School Education. Tuning Occupational Therapy Structures in Europe.